That’s a good thing. Freedom of speech is paramount in our Constitution based on the inalienable rights that God gives each human being. The free speech movement took place during the height of the Vietnam conflict, the hippie culture. and the overall youth free love/sexual revolution. The young dreamers demanded their right to speak out. They said that “freedom” was the issue. But today’s generation is actively squelching free speech–at Berkeley and many other bastions of education. Why was free speech sacred in the 60s but now banned by the same people this century? The past year saw numerous incidents at university campuses where conservative or faith-based speakers were either shouted out or shut down from speaking on college campuses. The most violent incident took place at Berkeley in early February when Breitbart News editor Milo Yiannopoulos was rejected by angry students who looted and burned buildings. Then Charles Murray was booed out of two east coast colleges. In late April, conservative writer Ann Coulter was denied the opportunity to give an immigration speech at, guess where–UC Berkeley! Actually, it was never about free speech. Never. Gary Randall of the Faith & Freedom Network shares an insightful perspective on the Trump visit. Randall states clearly that a worldview contest is being bitterly waged in the “Western” part of the world, i.e. Europe and North America. My new book (due out in late fall), River of God: Where Religion Began and Why Grace and Love Will Triumph, contains two chapters devoted to that worldview war. I call the battle between biblical faith and secular atheism the “Western Theatre.” One worldview will triumph over the other (over time) and one will recede. So what does this worldview battle have to do with free speech? Over two thousand years, God, through His Church, created a faith-based culture in the Western world that became the primary fountain of civil liberties, economic prosperity, human rights and world evangelization. It was the most enlightened civilization in history–Western civilization–built on truth, love, law, morality and biblical ideas. Satan’s goal has never changed: Stop God’s global salvation plans by weakening the Church and tearing down Bible-based cultures. Free speech in the sixties was a means to that end–freedom to rebel against God-given authorities, structures (marriage) and morals (chastity). 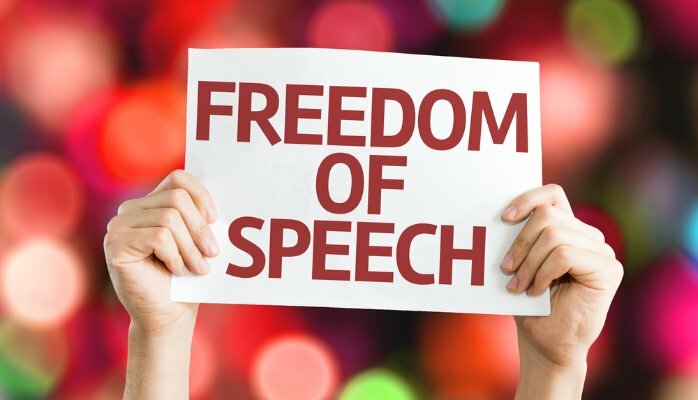 In the 21st century, many sixties radicals (now liberal professors ) encourage the new generation to do the opposite of what they did–deny freedom of speech. Why? Because the goal hasn’t changed. “Freedom” launched the rebellion. Fascism will finish it. The Satanic strategy is to destroy godly culture, using freedom in one generation and tyranny in another. The unchanging end justifies the use of different methods. Now you know why free speech in the 60s is being banned this century.